Aidan Harte was born in Kilkenny, studied sculpture at the Florence Academy of Art, and currently works as a sculptor in Dublin. He has also worked in animation and TV, and in 2006 created the show Skunk Fu, which has appeared on several channels around the world, including the Cartoon Channel. 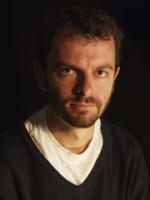 CLICK HERE FOR MORE BOOKS BY AIDAN HARTE. The Wave — (2014-2016) Publisher: The river Irenicon is a feat of ancient Concordian engineering. Blasted through the middle of Rasenna in 1347, using Wave technology, it divided the only city strong enough to defeat the Concordian Empire. But no one could have predicted the river would become sentient–and hostile. Sofia Scaligeri, the soon-to-be Contessa of Rasenna, has inherited a city tearing itself apart from the inside. And try as she might, she can see no way of stopping the culture of vendetta that has the city in its grasp. Until a Concordian engineer arrives to build a bridge over the Irenicon, clarifying everything: the feuding factions of Rasenna can either continue to fight each other or they can unite against their shared enemy. And they will surely need to stand together — for Concord is about to unleash the Wave again. 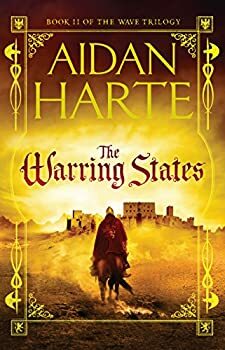 The Warring States is the second book in Aidan Harte’s THE WAVE trilogy, coming after last year’s Irenicon, to which I gave a three-star rating recently. Unfortunately, I’d describe The Warring States as a bit of a step backwards, mostly due to pacing issues.